My beard lasted 2 weeks until my face became uncomfortably overrun with whiskers, and I had to eradicate them. I guess I’m just not a beard guy. But hey, what I did decide was to find the least expensive way to shave. You see, Gillette, and the other manufacturers of shaving stuff, spend big money to develop new and exciting ways to shave your face. In fact, Gillette spent over $750 million (!) to research and develop the Mach3 razor that I was using. They’re even so nice that they’ll give you a free handle so you only have to buy the cartridges! I find it a bit amusing that these big corporations spend the GDP of some countries to develop a new razor – the Gillette Fusion with it’s fancy 5 blades recently one-upped the Mach3 – when there’s a perfectly fine way to shave which men have been using for over 100 years. Well, I can tell you why Gillette does it. They make gobs of money from it! Those Mach3 blades cost them 9 cents to make and cost us consumers $3. 1. Razor: the Merkur Model 180 Long Handled Safety Razor . I use this model because I like the weight and the longer handle. It’s about $30 new but if you’re lucky you might be able to score a free one that your grandpa isn’t using anymore. Or check Craigslist, eBay, or the local antique stores for a used one. 2. Double edge blades: the Derby Extra Double Edge Razor Blades come a hundred blades to a pack and will set you back about $8. 3. Shave cream: I like Taylor of Old Bond Street or Proraso . Even though they are expensive, I find I use much less of them compared to the goop sold in cans. Only a pea size amount will easily lather your whole face. 4. Aftershave lotion: for when you’re done shaving you’ll want a decent lotion like Proraso . You only need a little dot of this stuff for your whole face so it lasts forever; I haven’t put a dent in my 2 year old bottle. 5. Shaving brush: optional, I never bought one. I had my eye on the Tweezerman Shaving Brush but I just lather in the palm of my hand, that way you don’t waste lather in the bristles of a brush. That’s it. You’ll be getting a shave that puts to shame anything a Fusion, Mach3 or other cartridge razor will do. Just remember to shave with the grain down, slowly and softly. You want to let the weight of the handle do the cutting, which takes some getting used to when you’re switching from a cartridge razor. 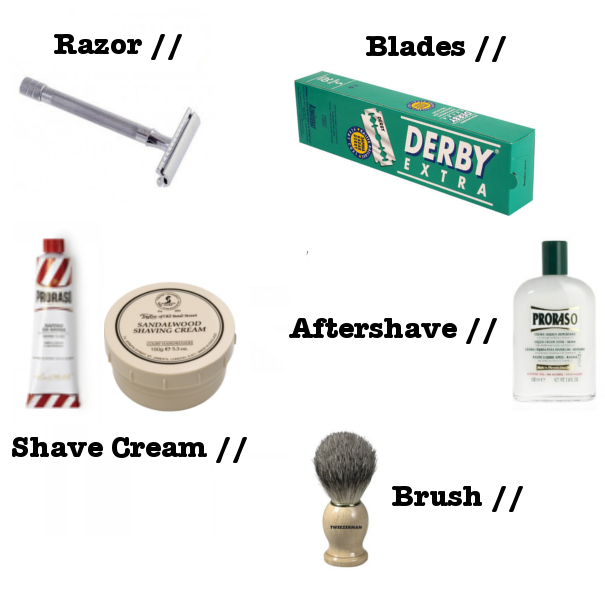 To save even more money you can go with a straight razor and a strop. That’s a nice setup because you buy the razor once, keep it sharp with the strop, and you never have to buy razors ever again. I wasn’t quite ready for a straight razor so I find a safety razor a good compromise. Let’s find out how much can you save by shaving like your grandpa. On December 8th, 2010 I received 100 Derby Extra Double Edge Razor Blades that I paid $7.95 for on Amazon. I am currently using my 40th blade from that order. With some good ole math I figured out that each blade costs me .0795 cents so I’ve spent $3.18 on blades for 2 years, $1.59 per year! For the purposes of figuring out the lifetime savings, let’s opt for the longer replacement cycle and use one month. From age 15 to age 76 (the average life expectancy for a U.S. male), using a safety razor and blades would cost you $96.99. From age 15 to age 76, using a Mach3 with replacement cartridges would cost you $1,588.44. 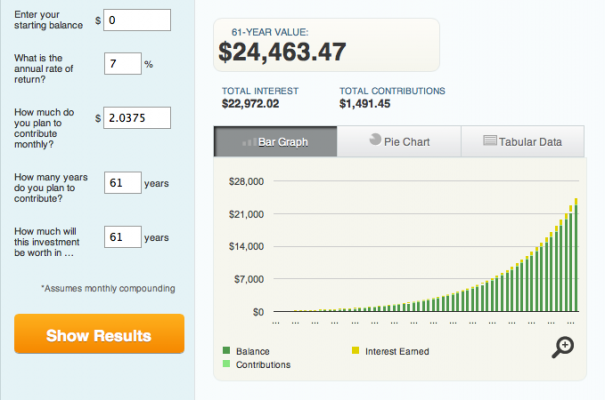 A cool $25,000 over a lifetime. So you’ll have more money, a closer shave and you’ll get to say “Screw you!” to a big corporation trying to squeeze everyday dollars out of you. Not too shabby. If you decide to go this route, or have already, please let me know how it worked out for you! I would love to hear about your experience.